Reach And Teach's Ivy Homeless in San Francisco author Summer Brenner invites you to the premier of a play based on her wonderful book, Richmond Tales: Lost Secrets of the Iron Triangle. It will be performed starting May 17th 2013 at the East Bay Center for Performing Arts. Having read and loved the book, we highly recommend you attend and enjoy! Congratulations Summer for bringing such an important story to life, helping to get it into the hands of tens of thousands of children, and now for helping to bring it to even more people in a new and dramatic way. East Bay Center for the Performing Arts has commissioned a dramatic script of Richmond Tales - a magical novel about everyday challenges, unlikely friendships and the coming of age questions that every adolescent asks about why the world it is the way it is. In this case the growing up takes place in Richmond's Iron Triangle neighborhood. Both the book and the play touch on the broad historical forces and waves of immigration that have shaped the neighborhoods and trajectory of greater Richmond as well as the imagination of two children who envision a future for themselves by traveling back (and forward) in time. In the national adult reading program -" One City, One Book" - libraries choose a summer reading book each year for a local community, hoping to engage widespread conversations about literature and reading. In 2007, Author Summer Brenner was asked to advise West County READS as they selected a children's book for summer reading in Richmond. However, when she and a children's librarian tried to find a narrative that reflected the rich, complex and critical experience of local children, they were stymied. 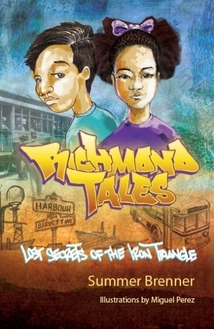 In 2008, Brenner made the decision to write that book: collecting stories from local youth to weave a tale blending adventure and historical discovery with the realities of Richmond life; and connecting young readers to a pride of place, knowledge of the past, and hope for the future. In fall 2008, Brenner received a grant from the Creative Work Fund of San Francisco to support the writing, illustration, design, and production of Richmond Tales, Lost Secrets of the Iron Triangle. The book was published in spring 2009. Over 4,000 free copies were distributed to middleschool students for summer reading in Richmond and throughout the district. Several thousand additional copies have since been printed and distributed, but a whole new generation of youth - and parents - have yet to discover this poignant Wizard of Oz like story, with bittersweet journeys through time, of how things are set in motion. In 2011 Richmond Rotary and East Bay Center forged a partnership to stage "Richmond Tales" with the full production values of East Bay Center and its newly rebuilt facility, the historic Winters Building in Downtown Richmond. Local Rotary members have engaged State and International Rotary clubs to participate. Both local and regional Rotary members have remained busy organizing project volunteers, working with families of youth participants, and will be providing assistance through out the production period with every thing from transportation and set building to audience development and financial underwriting. TICKETS/INFO: East Bay Center 510-221-6353 box office or visit our website by going to news and events and click on purchase tickets, or purchase tickets at the door.